"I had the good fortune to attend this concert in Budapest on March 29th, 2003. It was a strange time to be traveling abroad as an American just a few days after the U.S. invaded Iraq. I arrived a few minutes late to the torrid sounds of "A Hard Rain's Gonna Fall". The band was so centered and focused â€“ Bill, Greg, David and Kenny performing as one - and the audience was transfixed. It was a very emotional moment that everyone present seemed to be sharing in an extraordinary, elevated sense. I was so filled with sadness and uplift at the same time. Tears immediately started pouring down my cheeks. And the concert just took off as a journey from there through Bill's own songs like "Ron Carter", "Monroe", "Eli" and "That Was Then" to classics like "Hurt", "Lost Highway", "Your Cheatin' Heart", "I'm So Lonesome, I Could Cry" and "I Heard It Through the Grapevine". I am so happy that this concert is available for Bill's audience to appreciate as I found it to be a deeply poignant experience â€“ one that ultimately felt like the best of what so-called "Americana" had to offer in the face of a tragic moment in our history. I hope some of that power comes across in the recorded version of this music. As I listen to it now, it certainly has that kind of effect on me." - Lee Townsend, Producer and Manager of Bill Frisell. Berkeley, CA. August, 2010. 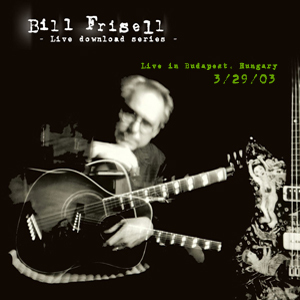 A tour featuring a reduced, hornless version of Frisell's band for 2001's Blues Dream (Nonesuch) finds the guitarist exploring a cross-section of material, ranging from more propulsive and direct versions of The Intercontinentals' "Boubacar" and "Eli," to an early version of the folkloric "Lost Highway," first heard on the download-only Further East (2005), and a lengthy look at Blues Dreams' spare, bass-driven "Ron Carter." Frisell also looks back at the eminently memorable "Monroe," from Good Dog, Happy Man (Nonesuch, 1999)â€”one of his best (if not the best) pure Americana records to date. Frisell rarely travels with an acoustic guitar these days, so it's a treat to hear him meshing organically with Liesz's dobro, propelled with the unshakable team of Wollesen and bassist David Piltch. Live Download Series #011's appeal is, in fact, the preponderance of acoustic material, including a version of Hank Williams Sr.'s "Your Cheating Heart" that swings with country elegance.